A screen capture of ArgoNeuT's first neutrino interaction event, as seen by induction and collection wire planes in the detector. An experiment that could help revamp the Intensity Frontier recently took a big step forward. The Argon Neutrino Teststand, or ArgoNeuT, uses technology that could be key to unveiling the role that neutrinos played in the early universe. The experiment, which could help make the case for larger, more powerful detectors, recently recorded its first neutrino interactions, the first ever seen in a liquid-argon detector in the United States. "Liquid-argon detectors can achieve high accuracy in determining the type of particle interaction. Because of this, they are very good at rejecting background events. These detectors can also get the same measurements as much larger detectors that use different technologies," said Brian Page, a graduate student at Michigan State University who works on ArgoNeuT. ArgoNeuT, a small, 175-liter, liquid-argon-filled detector, sits upstream of the MINOS detector in the neutrino beamline. Neutrinos from the NuMI beamline enter the ArgoNeuT detector chamber and interact with argon atoms. The interactions produce light and charged particles, which continue to travel through the argon and knock electrons loose. A wire plane attracts these electrons, which induce electrical signals. 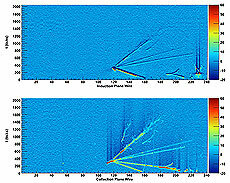 The data collected helps scientists reconstruct a 3-D image of the original interaction event. Scientists lowered the experiment, commissioned in 2008, into a detector hall in January 2009. It was filled with liquid argon this May, and saw the first interactions on May 27. "Seeing the neutrino interactions is another step towards showing us that we can build these detectors for the long baseline neutrino oscillation program at the proposed Deep Underground Science and Engineering Laboratory," said Bonnie Fleming, ArgoNeuT spokesperson. ArgoNeuT's research results will help to develop larger liquid-argon detectors. 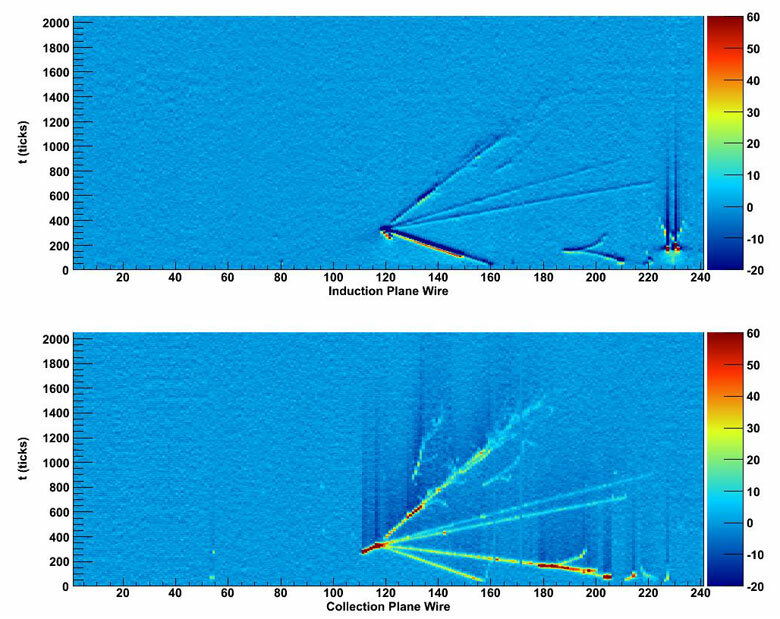 ArgoNeuT scientists will test argon purification techniques and develop software to correctly identify and analyze the interactions. "ArgoNeuT is a nice stepping stone," said Mitch Soderberg, a post-doc from Yale University who works on ArgoNeuT. "Then we're ready to get to MicroBooNE, a much larger liquid argon detector that has been approved to run here at Fermilab." New employees who began work on June 15. Front row from left: Halley Brown, Julie Allen, Giulio Stancari, Brian Skrobot, Sampriti Bhattacharyya, Terry Barchfeld, Brandon Stevens and Emily Drabek. Second row from left: Scott Smedinghoff, Peter Dong, Martin Shaffer, Tony Svozil, Kalyan Pallati, Alexander Dzyuba, Alex Pischalnikov, Colin Sylvester and Alexandria Coutrakon. 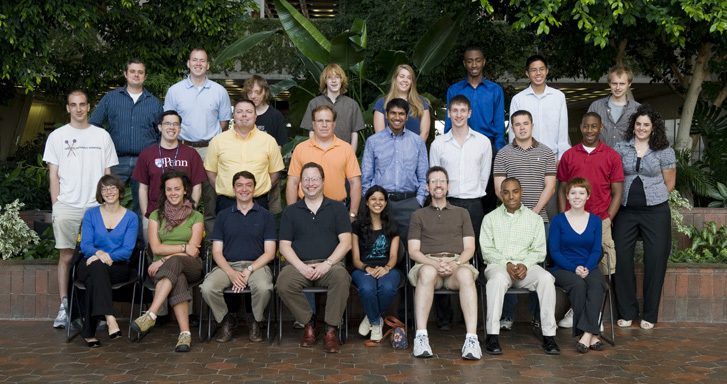 Third row from left: Sebastian Carron Montero, Jeremy Smith, Aaron Bossert, Alexander Morris, Erin Boyd, Jonathan Oderinde, Andy Nian and Nikolay Perunov. The House Energy and Water Development Appropriations Subcommittee has completed work on its version of the FY 2010 funding bill, and sent it to the full Appropriations Committee for its scheduled consideration on July 7. At that time, the report accompanying this bill will be released. The legislation will go to the full House on July 15, with two days of anticipated debate. The House leadership wants to gets its versions of the twelve FY 2010 appropriations bills finished by the start of the August recess. Disagreements between the political parties about the funding levels in these bills and the process under which they are being considered have led to complaints on both sides of the aisle. The rules of the House make it more likely that the House will meet its target date. The Senate is a different matter, and no one is predicting that all of the appropriations bills will be enacted by the October 1 start of FY 2010. Karen Kephart, Assistant Division Head for Technical Support, wrote this week's column. Alignment of new Booster correctors, installation of MINERvA modules, assembly of Project X cryomodules, aluminum sputtering of T2K components, liquid-argon detector R&D and DZero detector operations. What do all these Fermilab projects and a seemingly limitless list of others have in common? PPD technicians are working on all of them, and they all need to get done as soon as possible. Balancing the priorities for these jobs can be tricky. PPD technicians are frequently asked to handle different tasks in rapid-fire succession. One technician works with the scintillator extrusion group producing MINERvA components; then with the Main Injector water hose replacement team during a shutdown; then with the Quality Assurance technician for NOvA's PVC resin. Another technician is responsible for CDMS's warm electronics, provides support for superconducting radiofrequency work and works during the shutdown on the Pelletron, the device that generates and accelerates the beam used for electron cooling. A third technician works concurrently on producing containers that hold our neutrino program's radioactive horns; repairs CDF's central outer tracker; and contributes to the Dark Energy Survey simulator construction. Many technicians are responsible for more than one job at the same time. For PPD technicians, the mantra is: "If it's safe and legal, it is your job." Many Fermilab projects owe a debt of gratitude to these dedicated technicians. Technicians are each expected to complete the task at hand as quickly as possible. PPD technicians often need to mentally switch gears and must work well either independently or with others. To get the job done, they interact directly and frequently with project managers. Fortunately, most technicians have comprehensive training plans and many are very experienced at evaluating work parameters before diving into a new request. Oh, and what is their top priority? The answer is obvious: The health, safety and professional development of the technicians uniquely talented men and women. Making sure that everyone has a chance to expand job skills and that everyone goes home without injury trumps everything else. There was no report produced this week. Any safety incidents will be listed in next week's report.